Intense - Multipurpose Website Template at BOOTSTRAP THEMES is a device-agnostic, modern responsive design that is customizable. It's designed to work well on desktops, laptops, tablets and mobile phones. 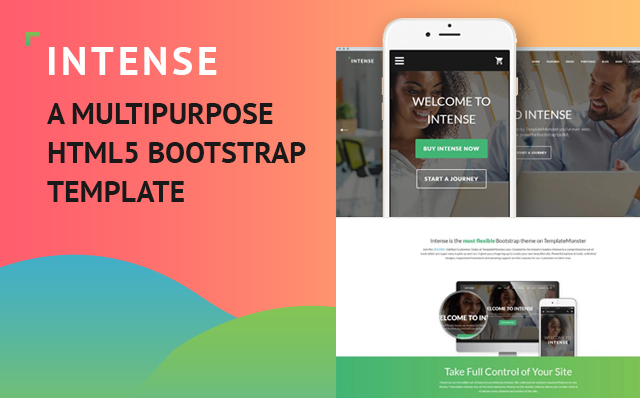 Intense is a responsive Bootstrap HTML5 theme by Template Monster that provides everything necessary to build stunning websites. Moreover, Intense is a multipurpose HTML5 template, meaning you can use it to create personal pages, business sites, eCommerce sites, portfolios, landing pages, online magazines, blogs, etc.. Intense is … 150+ pre-designed pages, 150+ layered PSD files, 50+ shortcodes, an extended Bootstrap toolkit, multiple child themes, plugins, social widgets, a working contact form and much more. When it comes to the pre-designed pages you can choose from 10+ homepage styles, 30+ blog pages, 20+ portfolio pages, 10+ eCommerce shop pages, 12 header & 4 footer styles.